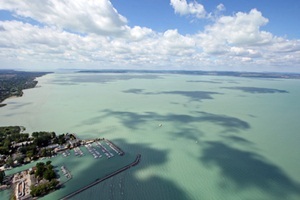 The Balaton or Lake Balaton is the most interesting sail district of Hungary. With a surface of almost 600 square kilometers he is the biggest lake of Central Europe and Western Europe, very flat with a maximum depth of briefly more than 12 meters, with warm water and hot summers thanks to the continental climate. The region around the Balaton is well known for excellent touristic infrastructure – and famous for wine-growing and distillery.